Well it’s been a while since I’ve had time to work on the box for my wife. But with Mother’s Day coming up soon(ish), I really want to get crackin’ on it. I have several things to do, some major and some minor. So I started with the minor. Sanded the entire box (minus lid) and glued up the bottom. The bottom simply fits (a bit snugly) into the rabbeted walls, so it’s not the best solution. But as I think I said earlier, as long as my wife doesn’t drop something heavy into the box, that bottom shouldn’t be going anywhere. I used glue only in a few spots along each end, so the sides will be able to move. It’s the best I could do at this point, as I just want to get the box done. Now for the major stuff. The stuff that I can’t afford to screw up because I really don’t have it in me to make new parts. The gut check stuff. The lid. My lid is still in four pieces – mitered with an inlay on the interior edge. 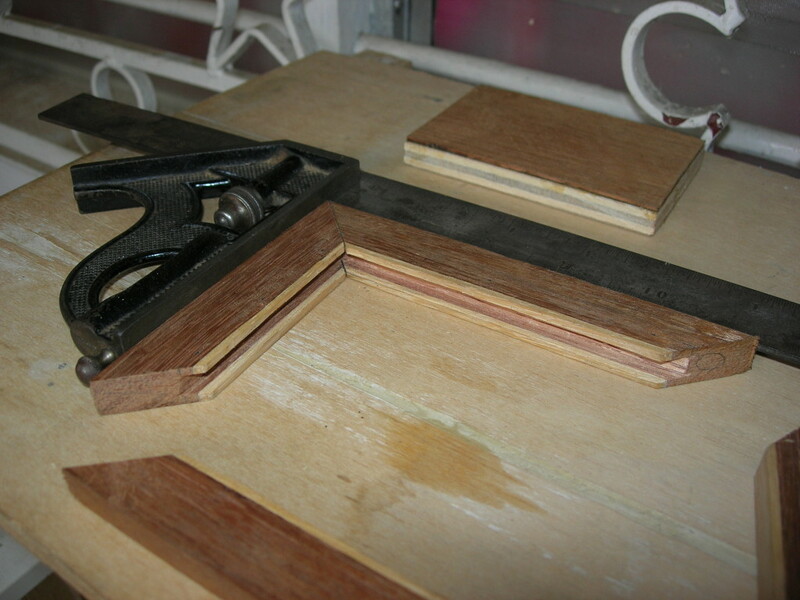 My task today was to create grooves in the interior edges, into which I’ll glue a plywood panel. Then I’ll custom cut a slightly thick veneer to glue on the top and bottom of the plywood. For the top, I’ll either go for a flush fit, or perhaps a slightly proud piece that chamfers down to meet the inlay. On the bottom I think I’ll have it recessed a bit from the frame, and chamfer the inlay to meet it. 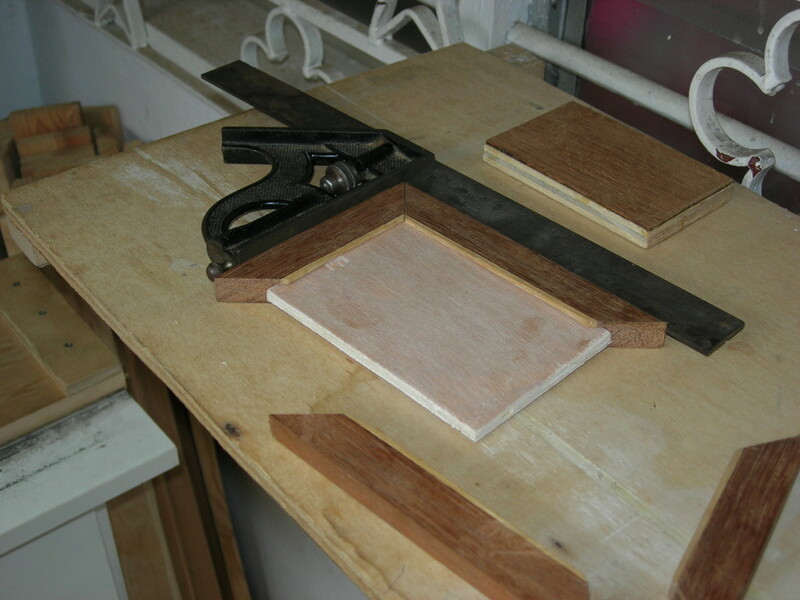 You may recall that I already did my hand-cut veneer, but the plywood that I glued it to was too thick for the mitered frame. So here’s what I’ve done so far. I had time for two of the frame pieces. You can see the first veneered panel in the background. I cut the outer lines of the groove with my ryoba saw, and then ran my 1/4″ chisel down the middle until I got to the right depth (about 3/8″). So. Good progress today. I figure another hour or so for my obsessive-compulsive self to do the other two pieces. It’s a bit stressful marking and cutting these narrow pieces, but so far so good.